Like all the other prominent names in the compact SUV segment, the Vitara Brezza too has the muscular and stubby stance which makes it larger than what it actually is. The lifted off frontal stance with a boxy design with clear lines make it look a bit old school, but then, there are some clear details in its design, which makes it an SUV of today’s times. 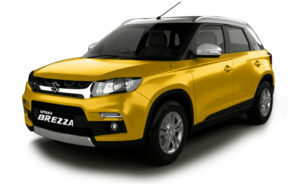 The Vitara Brezza is actually based on the XA-Alpha concept which Maruti Suzuki previewed few years ago at the Delhi Auto Expo, and while it isn’t as flashy as the latter and has got a much toned down design in its production guise, it gets a number of design cues and features, making it a contemporary vehicle.Starting off from the front, the Vitara Brezza gets a lifted off stance with a chunky looking chrome grille, which gets squared off fins within it clearly inspired from the XA-Alpha’s front grille. The headlamps have a simple rounded rectangle like design, but then, they do get funky looking projector bulbs with daytime running LEDs. The front bumper too has a bulgy design, with black claddings and prominent positioning of fog lamps with turn indicators placed above them, which is something other vehicles in its segment are not having. The side profile of the Vitara Brezza does get a rather clean profile with two sharp creases – one running from the front headlamp and ending up on the rear door, and the other being below of it which starts on the rear door and ending up in the rear tail lamp. The black colored body cladding form the front bumper is extending all the way onto the sides as well, giving it a lofty stance, which is further complemented with its high 200mm ground clearance. The top most variant of ZDI+ gets a dual tone treatment for its roof, which gives it a stance of a floating roof. The doors and mirrors have got very mild design, making the overall side profile appear boxy. However, the 5-spoke alloy wheels have been given a very nice and upmarket design treatment.At the rear, the Vitara Brezza has got a bulky stance, thanks to the wide profile accentuated by two big trapezoidal tail lamps and a big thick chrome bar with the name of the car embodied on it, much like what we have already seen on the Renault Duster. These tail lamps do get the same kind of LED light guides as on the front headlamps.